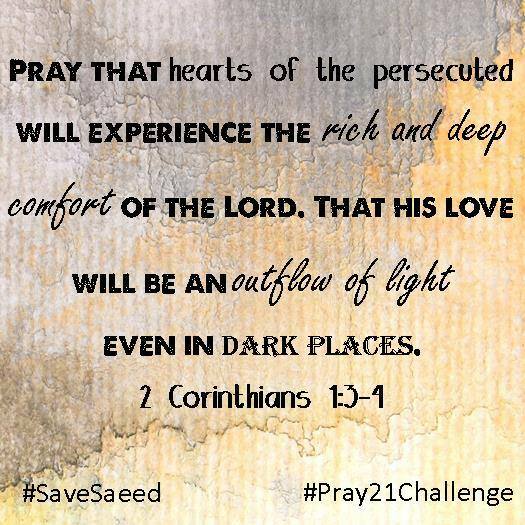 Here is today’s prayer that was posted on the page for Pastor Saeed. Please keep him and the other persecuted Christians in your prayers. 8 We think you ought to know, dear brothers and sisters, about the trouble we went through in the province of Asia. We were crushed and overwhelmed beyond our ability to endure, and we thought we would never live through it. 9 In fact, we expected to die. BUT AS A RESULT, WE STOPPED RELYING ON OURSELVES and LEARNED TO RELY ONLY ON GOD, who raises the dead. 10 And he did rescue us from mortal danger, and he will rescue us again. We have placed our confidence in him, and he will continue to rescue us. 11 AND YOU ARE HELPING US BY PRAYING FOR US. THEN MANY PEOPLE WILL GIVE THANKS because God has graciously answered so many prayers for our safety. Today in my devotional as I was praying for Saeed and our situation, I was reminded of these verses and how I have had to reach the end of myself and to be crushed and overwhelmed beyond my human abilities before I was forced to LEARN to rely ONLY on God. Today you might think “I am tired” or “I am done” or “I can’t go on any longer.” Those closest to you have hurt you or have abandoned you. You feel alone and overwhelmed. It is OK. This is a good place to be at. Like me, you are learning to rely only on God and to trust Him. May we learn to calibrate and re-calibrate our hearts back to God during this time of prayer and fasting and to allow the Holy Spirit to reveal to us places where we have put our confidence, sense of security, and self worth instead of in God.